SNAFU! : USAF launches effort to equip Reaper UAS with air-to-air missile...is this a mini missile truck? USAF launches effort to equip Reaper UAS with air-to-air missile...is this a mini missile truck? 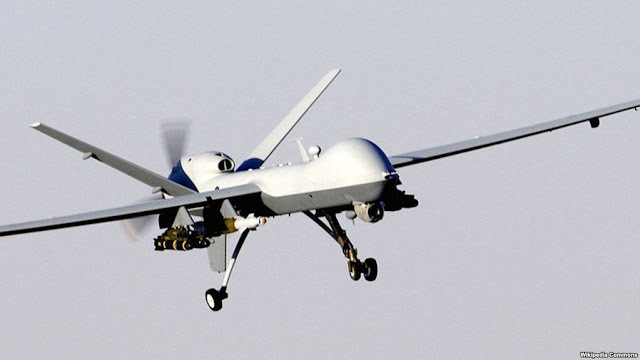 The US Air Force (USAF) is looking to equip its General Atomics Aeronautical Systems Inc (GA-ASI) MQ-9 Reaper unmanned aircraft systems (UASs) with an air-to-air missile (AAM) capability for the first time. The Air Force Life Cycle Management Center (AFLCMC) Medium Altitude UAS Division disclosed on 7 March that it intended to award the original equipment manufacturer (OEM) a sole-source contract for the development of MQ-9 Reaper Air-to-Air Missile (RAAM) Aviation Simulation (AVSIM) as the first step in the process of fielding such a capability. No details as to the type or capabilities of the proposed AAM were disclosed, neither were proposed development and fielding timelines or contract values. The Reaper can currently carry up to 16 Lockheed Martin AGM-114P Hellfire missiles. It has also been cleared for the carriage of two GBU-12 Paveway II laser-guided bombs and the GBU-38 500 lb variant of the Joint Direct Attack Munition (JDAM), and for mixed loads of these weapons. I don't know how bombs translate to air-air missile carriage but it should be formidable. Would a Reaper be a decent mini missile truck? In the fleet defense role it could hang out on the edges of the battlefleet and launch on enemy planes as instructed....acting as an airborne picket working as part of Naval Net Fires?